Current transformers for multimeter to 150 A AC, Æ max. 10 mm, different output signals - The opening width of the clamp to this converter is 39 mm. The measured current is a conversion ratio of 1000; 1 or 100: 1 output as direct or alternating current or voltage of the clamp convertor. The clamp convertor is connected via the connector to any multimeter or to a data logger. Current transformers for multimeter to 150 A AC, Æ max. 10 mm, different output signals. The clamp convertor can be used both for currents up to 150 A and for small currents of a few mA. The clamp convertor of the mini-series measures the AC reliably and accurately. Cables with a diameter up to 10 mm can be added to the clamp convertor. The opening width of the clamp to this converter is 39 mm. Current transformers for multimeter to 150 A AC, Æ max. 10 mm - The clamp convertor is connected via the connector to any multimeter or to a data logger. In addition to the measurement of simple direct current at 50 Hz, the clamp convertor of the mini-series measures the TRMS current up to 10 kHz, if the connected meter also supports this measurement. The clamp meter convertor of the mini-series impresses with its compact dimensions. The clamp convertor can be used both for currents up to 150 A and for small currents of a few mA. The clamp meter convertor of the mini-series measures the AC reliably and accurately. Cables with a diameter up to 10 mm can be added to the convertor. The opening width of the clamp to this converter is 39 mm. Current transformers for multimeter to 150 A AC, Æ max. 10 mm, different output signals - The clamp convertor can be used both for currents upto 150 A and for small currents of a few mA. 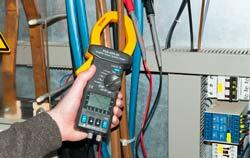 The clamp meter convertor measures the AC reliably and accurately. Cables with a diameter up to 10 mm can be added to the clamp convertor. The opening width of the clamp to this converter is 39 mm. Current transformers for multimeters, oscilloscopes and current faults, max. 200 A AC, max. Diameter 20 mm. With its bandwidth of 10 kHz, the Clamp Meter MN series is designed for various applications such as fault current, power and harmonics measurements. The Clamp Meter offers 3 choices for output. In addition to AC and AC voltage, a DC voltage output is possible from the Clamp Meter MN series. Current transformers for multimeters, oscilloscopes and current faults, max. 200 A AC, max. Diameter 20 mm. With the high bandwidth of 10 kHz, the Clamp Meter MN series is designed for various applications such as fault current, power and harmonics measurements. The Clamp Meter MN series offers 3 choices for the output. In addition to AC and AC voltage, a DC voltage output is possible from the Clamp Meter MN series. With the high bandwidth of 10 kHz, the Clamp Meter MN series is designed for various applications such as fault current, power and harmonics measurements. The Clamp Meter MN series offers 3 choices for the output. In addition to AC and AC voltage, a DC voltage output is possible from the Clamp Meter MN series (delivered manufacturer calibrated - ISO certification as an option).